Got talkng to these guys – they got married yesterday and for their honeymoon came all the way from Finland to Dublin to see their favourite band – they even got matching Therapy? tattoos instead of wedding rings! Thanxx Carrie for the pixx! My name is Petri and my wifes name is Kati. Our honeymoon wasn´t that long as tomorrow we gotta go back to work again, booooring!! 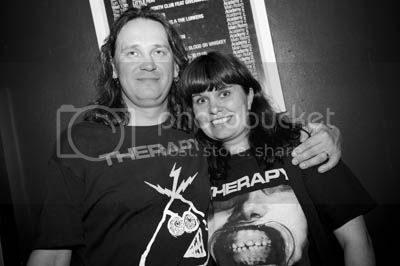 But Therapy?s gig at the Dublin Academy was a blast!! It was the topping on our weddingcake for sure! Once in a lifetime moment for us for sure as this marriage will last to the grave! congrats again and a pleasure meeting you both!! It was a pleasure to meet you too Carrie! Any chance to buy you prints from the Therapy? live pics you took at the Academy gig as most of the pics we took from the front didn´t succseed:( There was too much smoke and the lights were just too spooky for our normal digitalcamera. And many thanxx too for you to when you took the pixx of us with T? dudes!